Yesterday Bernanke let everyone know that he was just joking about "tapering" QE, and that what he really meant to say was that he was considering "toilet papering" his neighbor's house, during mischief night this coming Halloween. At least, I assume that's what he said, based on the market's reaction. Honestly, I don't even listen to the guy anymore. The cash market did its usual "Fed Wednesday" whipsaw action, but the cash market isn't really the market anymore, so who cares what happened during regular trading hours. We all know that's irrelevant these days. Shortly after the market closed, the futures shot up like a rocket, once again proving right the pundits who say that the market is driven by the economy and not by Quantitative Easing. I assume these pundits share an apartment under a rock with the dudes in the Geico commercials. Bulls will once again have another resistance level cleared while they sleep, and not be forced to make the painful decision of whether to sell at resistance or hope for higher prices. There is no such thing as resistance in a Bernanke Market. Just one chart today, because really, what is there to add? In conclusion, it appears wave iv did indeed bottom at 1560. Bears' last stand is at the all-time high (which I'll probably short simply due to the risk/reward proposition) -- but nevertheless, this remains a bull market until proven otherwise. Trade safe. 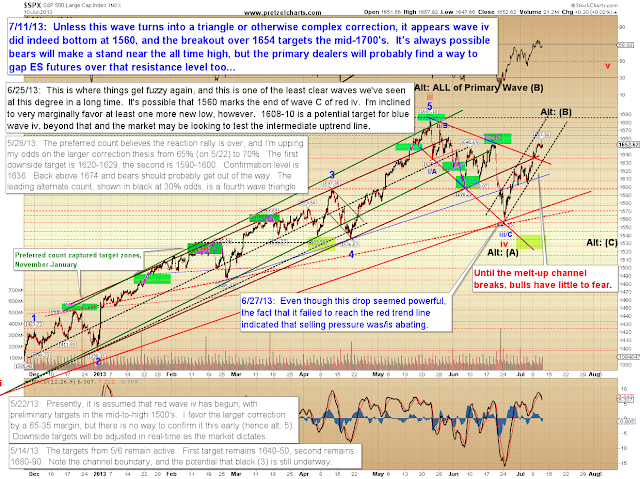 "In conclusion, it appears wave iv did indeed bottom at 1560." Yup, Pretzel. I decided the same on Monday when we gapped over overhead resistance and held it. Your rant today shows why EW, fundamentals and charts are utterly worthless in this market. That is what I told you six weeks ago. Lesson learned a little late.